Oh, the universal Bard. First, Will took a trip to modern-day India. There, he rubbed elbows with the "I wear my sunglasses at night" kingpins of Bombay's criminal underworld. And we were much entertained and impressed. 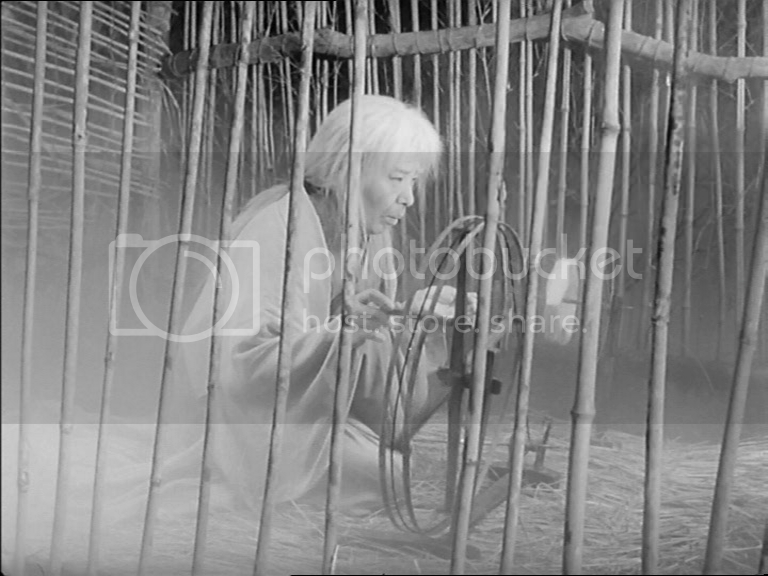 Now Will's taken a trip to fuedal Japan, and he's put the brain of Macbeth into the head of Toshiro Mifune. Oh, this monochromatic tale has set off multicolor fireworks in our aesthetic pleasure center. Someone hide our joy before we implode! We used to have samurai action figures very similar to these. "What does that mean?!" you demand. We don't know. It's been a long day. And it's been a very Macbethy month. Just a week ago we reviewed the Indian adaptation, Maqbool, which we thought was a clever reinterpretation of the bloody Scottish tale. 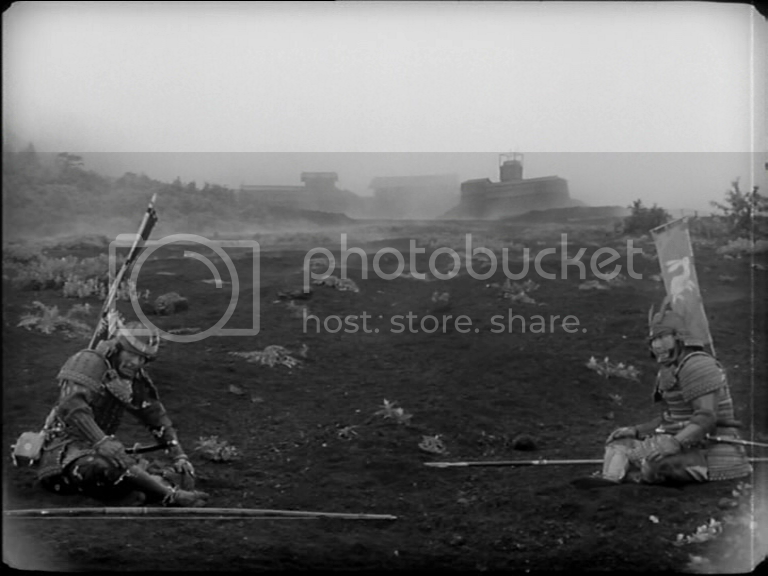 Now we've come to review Akira Kurosawa's masterpiece, Throne of Blood, a more straightforward, but also much more strikingly beautiful, adaptation. The Mac and his Lady. Check. Instead of Castle Dunsinane in Scotland or Abbaji's mansion in Bombay, we're in Cobweb Castle somewhere in a very foggy region of Japan. 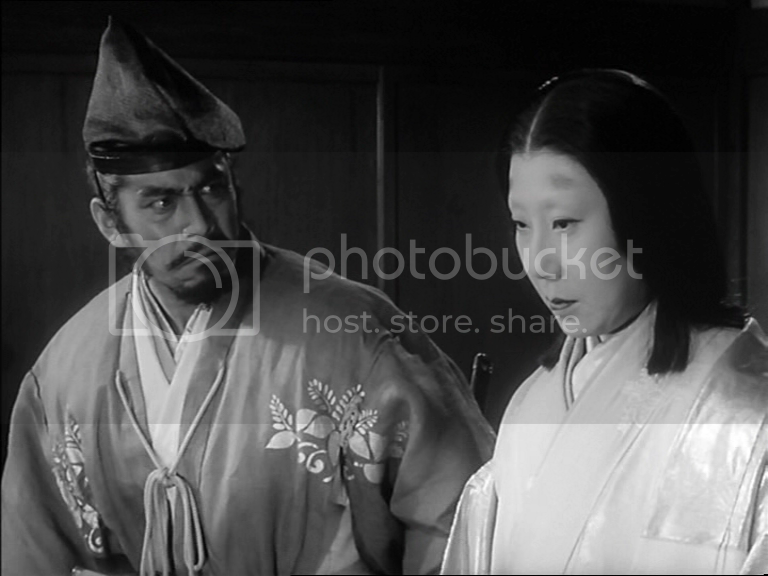 Macbeth is called Washizu (Toshiro Mifune), his best buddy Banquo is Miki (Akira Kubo), and there's only one witch (Chieko Naniwa). The story follows the original very closely; in fact, the only thing that's missing is, well, the English language and the Scottish dress. Everything else is the same, par for par. Fresh from victorious battle, Washizu and Miki ride triumphantly back to Cobweb Castle. They get lost in the aptly-named Cobweb Forest and, after a lot of horses neighing and fog rolling, they come upon a very creepy androgynous type person who sits spinning thread (spinning fate, dare we say!) and singing in a drone. Clearly we have met a witch. The other two must be on a lunch break. The lone witch lays the prophesying smackdown: Washizu, you'll soon be master of Cobweb Castle (cackle), but Miki's sons will inherit it (wheeze). A riddle! Uh oh. Washizu and Miki go, "HA HA HA!" in all-too-transparently-false bravado. They ride back to the Castle and try to shake it off. But it's hard for Washizu to shake anything off, especially when his Ice Queen of a wife (Isuzu Yamada) keeps filling his head with evil plots full of ambition and blood. Washizu tries the "lay off me, woman!" routine, but his manly resolve fails, and sooner rather than later he's holding a blood-stained spear in his hands, and the King is dead. Double uh oh. A note on Macbeth: it tends to peak early. The best bits, in our opinion, are the ones when Macbeth and Banquo are riding around, heads filled with frightful notions of what might be and what it means. Will Mac let fate take its course? Or will he change it, ruthlessly, and inevitably condemn himself? For us, the climax is when Macbeth kills the King and stumbles back to his wife with hands covered in blood. MACBETH: Methought I heard a voice cry 'Sleep no more! Ooh, we love it. Panic! Panic! Exciting! The rest of the play just watches the sad degeneration of the Mac and his Lady as they fall further into despair and craziness. By the last scene, we're usually like, end it. End it now. Ugghhh. 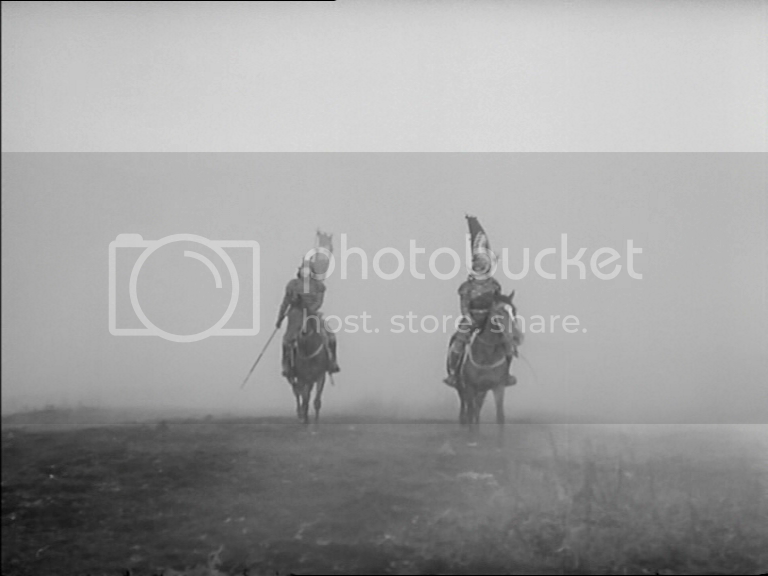 Throne of Blood, however, manages to maintain that giggly horrorshow excitement of the beginning throughout the entire film. For this reason alone, we were very impressed. The end, where we have been known to get impatient and glance at our watch in other productions, was so surprisingly scary that we almost started screaming along with Toshiro. 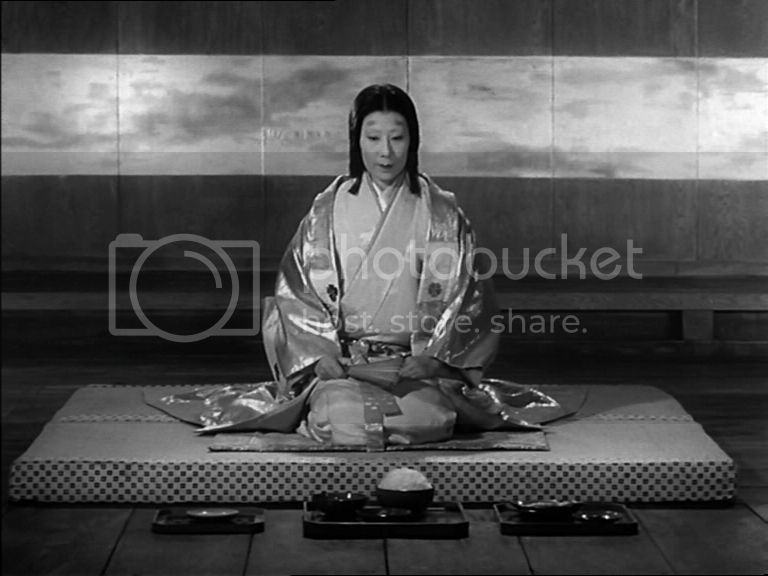 As the protagonists, Toshiro Mifune and Isuzu Yamada are wonderful at conveying the precarious sanity which make Mac and the Missus so uniquely who they are. What a couple! And it's interesting that Kurosawa chose to portray their love as something so cold and, well, nonexistent (Macbeth seems more scared of his wife than he was of the witch! ); usually the Mac and his Lady are passionate hotheads. Instead, these two speak through powerful stares and meaningful silences. It makes everything feel cold, inhuman, and yeah, pretty awkward. Their transformations then, are especially creepy, as they essentially go it alone. (In other productions, it's like, at least they have each other!) 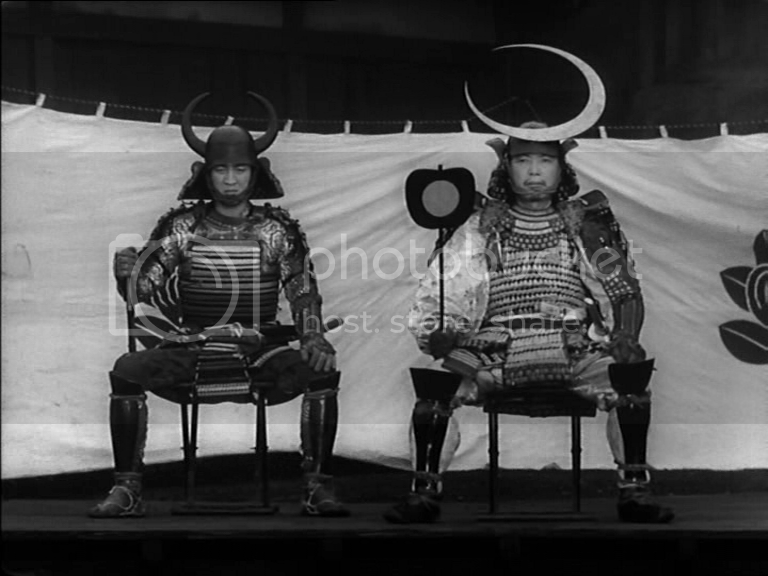 Mifune's Washizu goes from a boastful, charismatic military commander to a wild-eyed and desperate loon. The final scene, especially, was amazing. 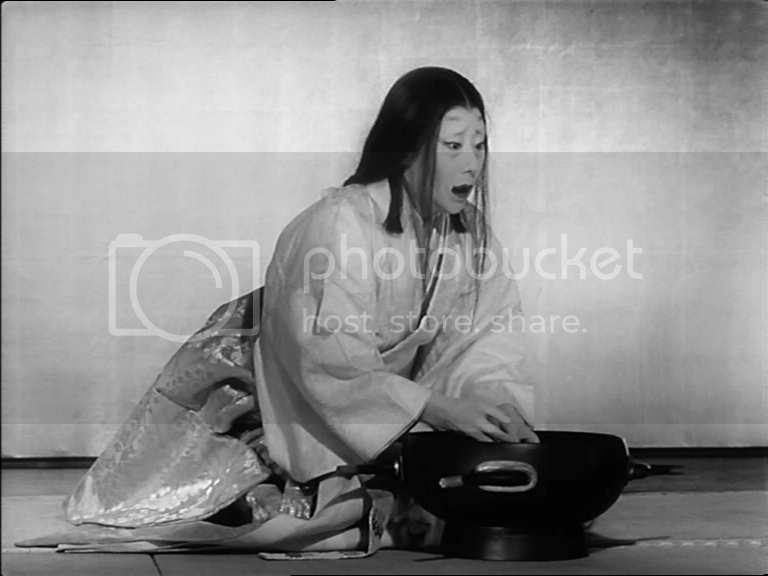 Yamada's Lady Washizu slow mutation from calculating to mentally shattered was equally disconcerting. In terms of imagery, the film is beautiful. But we expect nothing less from Kurosawa-san! 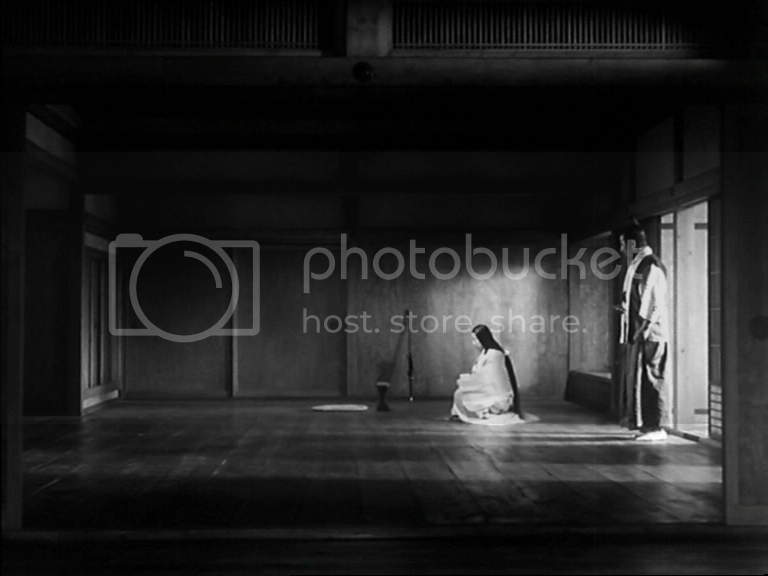 We were even happy to see it was black and white; everything took on this fascinatingly textured appearance, and we ended up marvelling at the shiny scales of Washizu's armor, the silk sheen of Lady Washizu's kimono, the polished wood of the interiors. Very pretty. Conclusion: Required viewing for any self-respecting esthete.